This month, the Vessel and the Joy (Marilyn Harper and Joeaux Robey) have been criss-crossing Southern California and Nevada in the magical-mystery-ship, Twinkle, disguised as a Honda Minivan! 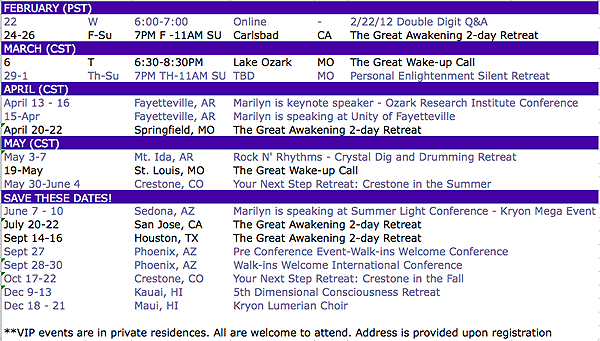 It’s the Great Awakening Tour of 2012!!! Follow us on FaceBook: “Like” our page, share our posts with your friends, and watch our videos. Together, we can awaken our planet. Quite possibly, 022212 is the only time this year with 5 repeating numbers in the date. Think magnification: energy of Divine Partnership, the shifting planetary grid, your thoughts, your journey into the 5th Dimension. This is a time of change with a focus on your personal path. 2 + 2 + 2 + 2 +1 + 2 = 11 which represents intuition. patience, honesty, sensitivity, and spirituality. 11 is idealistic. 11’s are typically inspirational teachers we personally choose. For the 02/22/12 Double Digit Group Session, Adironnda & Company will answer questions, both personal and galactic during a LIVE Webinar Q&A, on Wed., Feb. 22, 2012 at 6PM PST. This is for subscribers only! Call (417) 860-5432 or Subscribe here.Double Digit Subscribers automatically receive a Webinar invite. Up to 10 questions will be selected to answer. Subscribers, please send your questions to info@Adironnda.com. Questions must be received within 24 hours of the Webinar. Not a subscriber yet? Call (417) 860-5432 or Subscribe here. You are the architect of your life experience. How’s that working out for you? Are you happy? Are you living your full potential? Are you surrounded by people who support your truth? Or, are you quietly hidden? Are you having fun? Join us in Carlsbad, California, for a jam-packed weekend with like-minded people who are seeking a Spiritual experience of catapulted growth. The “mind expansion” begins promptly, Friday, February 24th at 7PM and comes to a screeching halt, Sunday, February 26th at noon. Bring an open mind and be prepared to “float” away from this experience as a lighter, more expanded being. As one participant of the Great Awakening 2-day Retreat said, “everyone should do this once a year. It’s like therapy.” Hurry, 5 spots left! Call (417) 860-5432 or Register here. Join us for 3 1/2 days of silence in the majestic mountains of Van Buren, Missouri, next to the Current River – the perfect metaphor for emotional clearing and the setting of our Personal Enlightenment Silent Retreat. Mostly, you will experience the power of silence and hearing your soul’s voice within the quietudes of your mind. Group discussions and insight from Adironnda sprinkled with a few activities will assist in magnifying your inner voice and bonding you with the other participants. You’ll arrive Thursday, March 29th and depart Sunday, April 1st, 2012. We will be staying at the historic Big Spring Lodge and Cabins in Southern Missouri. Come and enjoy the peace and quiet. Call (417) 860-5432 or Register here. If you would like for Adironnda to come to your town and can gather at least 10 people, or introduce us to a new thought church or bookstore, just let us know. We are making our way across the United States and would love to see you! We’ll add you to our growing list of VIPs. Email info@adironnda.com. Check back often for schedule updates! What’s all this talk about Starseeds?